Everton produced a brilliant performance to stun Manchester City and deliver a serious blow to Pep Guardiola’s Premier League title hopes. The Toffees willingly soaked up 71 per cent of City possession but restricted Guardiola’s side to few chances and scored with four of just six attempts at goal. Romelu Lukaku coolly side-footed in a Kevin Mirallas cut-back and the Belgium internationals combined again after the break, Mirallas drilling Lukaku’s through-ball across the keeper. Tom Davies sent Goodison Park into raptures on just his second league start by dinking a third over Claudio Bravo and £10m debutant Ademola Lookman fired between the legs of the keeper in injury time. Goals from the two teenagers left Everton boss Ronald Koeman visibly elated, while Guardiola cut a frustrated figure, remonstrating with the fourth official late on in what is his heaviest ever league defeat as a manager. 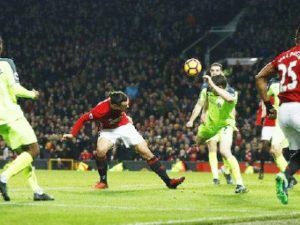 Zlatan Ibrahimovic scored a late equalizer as Manchester United earned a draw against rivals Liverpool. Ibrahimovic headed in after Marouane Fellaini had nodded against the post as the home side pressed for an equalizer. The visitors had taken the lead when James Milner converted a first-half penalty following Paul Pogba’s handball. Georginio Wijnaldum could have won it for Liverpool in added time but hit a tame shot at keeper David de Gea. The result left Liverpool in third place, seven points behind Premier League leaders Chelsea, while United remain sixth – 12 points behind the Blues.